At some point the processor, hard drive, amount of RAM and/or graphics card simply can't keep up with the latest software. One of the components in your Mac has failed or is failing. The operating system or application is not working as it should. When it comes to troubleshooting a Mac, there are many possible roads that lead to a solution and it's all about process of elimination. Also, most troubleshooting takes time; you try a solution and then test to see if it worked. This is the only way to see if a solution is just a temporary fix or a permanent one. Let's start with the basics—when your Mac is getting slow, follow these troubleshooting steps to make it faster. 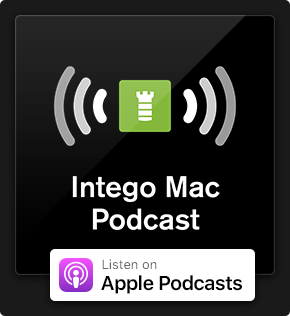 Whether the cause of your Mac's performance issues are hardware or software, the issues are there and you need to get your Mac to run faster. Troubleshooting a lagging Mac can be pretty invasive or put additional strain on a system, so don't risk potential data loss—backup your data first. 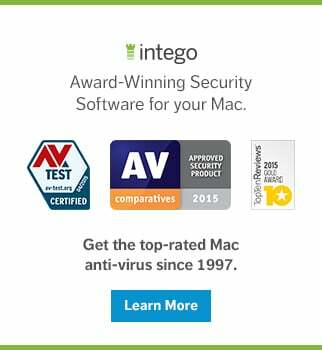 Time Machine and Intego Personal Backup are some ways to reliably do this. Restarting your Mac is easy and quick, or at least it should be. What a system restart does is it clears the memory and forces any processes that may have been stuck to reload. The amount of time it takes for your Mac to go from black screen to loading your desktop can also be a good indication of where to look for issues. Most Macs, regardless of configuration and operating system version, should be up and running in no more than one minute. Newer Macs or Macs with a solid state drive typically load the operating system and user environment much faster than that. If a restart did not solve your issues or only fixed them for a short time, it's time to see how your Mac's hardware is being used by the software. Is your Mac using too much RAM and running out of memory? Are certain processes causing your Mac to freeze up? How would you know? Mac OS X (or macOS, if you run Sierra) has a very useful utility built in, called Activity Monitor. This utility gives you a live view of processor, RAM, hard drive and network usage on your Mac. You can find this utility in Applications > Utilities > Activity Monitor, or by using Spotlight. 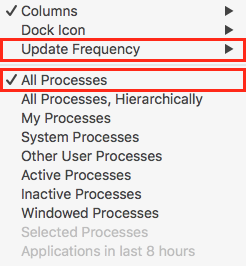 In the same menu, make sure you check "All Processes." Activity Monitor will now show all processes in real-time, which makes it much more useful. The information is sorted into different tabs that display processes in the category specified, and each one can help you narrow down the issues you're having. Is a certain process causing excessive CPU load on your Mac? If a process is consistently taking up a high percentage of processor power, you can quit that process to see if it resolves the performance issues. If you do not know what the process belongs to, do a search online to see what it is and how to address any issues with it. If the process clearly states what it is, you know which application might be the cause of the issue. You also want to check the graph and information at the bottom of the window. Whether you have a dual-core or 12-core Mac, these stats show how 100% of your processor power is used. Let's say you cannot find any processes that take up an unusual amount of power, but the stats at the bottom show hardly any idle (available) power, then your processor may simply be too old or slow for what you're trying to do. If idle is 0% or close to it consistently, then your processor simply doesn't have the juice to take on any new tasks and is probably struggling with the tasks that are already running. Try running fewer applications simultaneously to see if that takes some load off the processor. Equally as important as CPU load, if not more, is the memory (RAM). Is your Mac crashing a lot? Well, macOS itself and every application that runs on it requires RAM to function, and if it runs out of available RAM, the operating system starts to use your hard drive as temporary RAM to avoid crashing. Your hard drive and even a solid state drive are much slower than the RAM chips, so this will impact overall system performance a great deal. Similar to analyzing the CPU load, check the list to see which processes are using the most memory. The graph and information at the bottom are also very useful. Yellow and red in the graph means the memory pressure is high and there is little to no available memory to take on new tasks. On the right of the graph, you want to make sure "Swap Used" is 0 MB or close to it. Swap Used means the operating system is using your hard drive as temporary memory as mentioned above, which you don't want. Similar to the steps taken to address excessive CPU load, try running fewer applications simultaneously to see if the pressure eases up and the graph goes back into the green. Once the pressure is no longer orange or red, the swap file that was created should start reducing in size. You can also restart your Mac to clear the swap file immediately. Ideally you want the memory pressure in the green at all times. If you find this is hard or impossible to do, you likely just need more RAM. Don't worry about the "Memory Used" statistics; the memory is there for your Mac to use, so it's OK if it uses a large amount of it. The pressure graph is what matters in this case. Do you have a MacBook Air or other laptop? If you use a laptop, this tab can help you identify which applications are using the most resources and thus using the most battery power. The energy tab may not show up if you use a desktop Mac, but it will be there for laptop users or desktop users who have a UPS connected. The Disk category shows the amount of data that is read and written for your entire system (all drives). It may help you narrow down which process is hogging the disk and causing other tasks to run slow. Are applications like Photoshop, Photos and iTunes running fine but Safari or Mail is running slow? The issue might be the network. Check this tab to see if any processes are sending or receiving unusual amounts of data. If your Mac has only been on (since a restart or first boot, not sleep) for an hour and yet it shows 5 TB of data have been sent, something is probably not right. Have a look in the list to see which process is responsible and investigate. Of course, the issue may be your Internet connection itself; in this case, use an online speed test to see if you're getting the bandwidth that you're paying for. One of the most common causes for a Mac getting slow is a full hard drive. Regardless of the size of your drive, you want at least 20 GB of free space at all times, preferably more. Let the window sit there for a few minutes to make sure it has time to calculate the available disk space and what's taking up that space. While the graph is nice, it's not nearly detailed enough in most cases. To see in much greater detail what's taking up space on your drive, have a look at Intego's Mac Washing Machine. If you frequently run low on drive space, it's probably a good idea to start utilizing an external drive or upgrade the drive in your Mac, if possible. Is your Mac just spinning when you ask it to do something? Your software may not be the cause of lagging issues. A failing drive, faulty RAM or other hardware issue can sometimes cause the same type of symptoms. For example, the dreaded spinning beach ball can be a software or hardware problem. Using the above steps 1-4, if the issue is software related, you should have a pretty good idea of what the culprit is; however, to test your hardware some different tools are required. There are tools built-in your Mac as well as third-party tools you can to use to help identify hardware issues that may cause a slow Mac. Disk Utility is a free and built-in feature that can help you with basic hard drive issues. You can find it in Applications > Utilities > Disk Utility. In the list of available drives, you will see the disk and the partition on that disk. The partition on your startup drive is traditionally named "Macintosh HD," or in the case of this screenshot, "Mac HD." Select your "Macintosh HD" drive and click the "First Aid" button. This is a good first check, which works on external drives and other partitions as well. The preferable outcome is a green check mark and a report that the drive checked out OK.
You can also run First Aid on the disk itself, which will check a few different properties. Depending on your selection of the disk or partition, you get different information. Select the disk to see if it reports any hardware issues through S.M.A.R.T. If the S.M.A.R.T. status is anything other than "Verified," it may have failed or be in the process of failing. Unfortunately, Apple's threshold for drive issues is very high, so usually when S.M.A.R.T. reports an issue in Disk Utility, the drive is pretty far gone. Your Mac has a basic hardware test built-in. To access it, restart your Mac and hold down the 'd' key immediately when hearing the startup sound. More instructions can be found here. As I mentioned before, Apple's Disk Utility is not great at detecting a failing drive until it's usually too late. 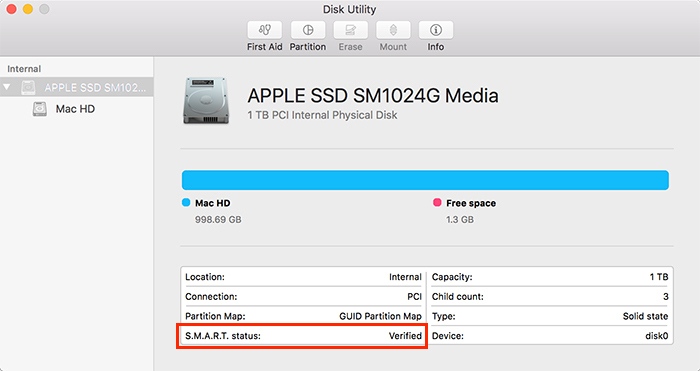 It also doesn't notify you, so unless you check Disk Utility every day, you won't see if the S.M.A.R.T. status is verified or not. SMART Utility - By far one of the best utilities out there to monitor your drive health. It will let you know if your drive is showing early warning signs of failure long before Disk Utility ever realizes something is wrong. It pings the drives in or connected to your system frequently for the most up to date S.M.A.R.T. reports and you get notified immediately if a warning pops up. 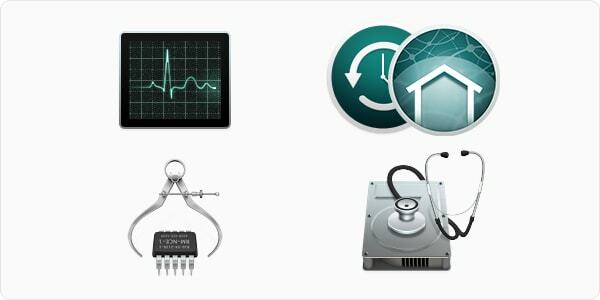 TechTool Pro - Test your drives, RAM, temperature sensors, graphics card, fans and more. This suite of tools is one of the best out there and will give you a full system checkup that's very easy to use. While mostly a testing suite, it includes some repair functionality as well. It's not easy upgrading Macs that were made after 2012, though depending on your needs there are some external options. If your Mac is a 2012 model or older, upgrading your hard drive to a solid state drive can be done easily, and upgrading your RAM to 16GB takes no more than a few minutes. When it comes to upgrades, there are a lot of options out there—have a look at this article for more information. When you have checked the software and the hardware but can't find anything wrong, don't want to fix it yourself or simply don't have time to run all the checks to begin with, you can always take your Mac to the doctor—Apple's Genius Bar. They will do their own checks of the hardware and the operating system, and they will let you know what needs to be done. This entry was posted in How To and tagged Fix, Mac, performance, Slow, troubleshoot. Bookmark the permalink. To be honest, pretty awesome tips. Following few cleanup tips will make your Mac faster. Remember to delete useless files from the Downloads folder. Also, you should get rid of duplicate files from time to time.